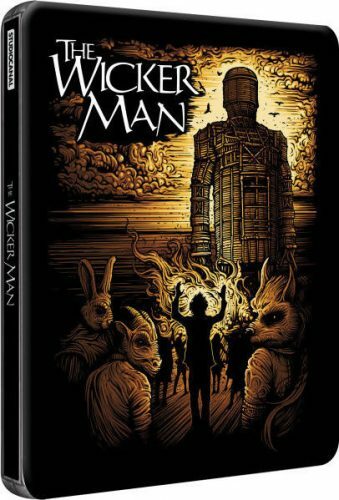 The W icker Man Gets some cool art work on a steel-book case for its first time on Blu-Ray edition thanks to StudioCanal. And no this is not the Nicolas Cage movie this is the original film made in 1973. The bad news is that (well for me) its only available in the UK through retailer Zavvi. I’m sad but StudioCanal does have the rights in the US as well so maybe they will do the same here but who knows. For the lucky UK folk they can get their hands on this on October 14, 2013, and I hope this is region free so than maybe I would by from over sea’s. Plot: Cult horror classic in which a devout Christian policeman (Woodward) is summoned to a remote Scottish island to investigate the disappearance of a child. While there he uncovers a bizarre pagan cult, led by Lord Summerisle (Lee). As preparations for a sinister ritual celebration reach fever pitch, the policeman begins to realise what role the islanders intend him to play. Britt Ekland and Ingrid Pitt co-star.